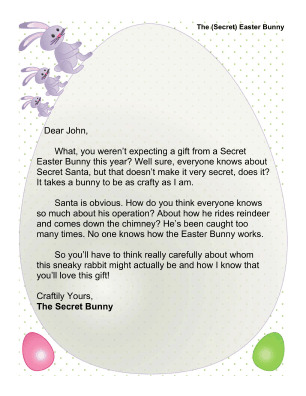 The Secret Easter Bunny is a gift exchange game that can be played like Secret Santa, except this bunny is much craftier and sneaky when it comes to giving presents to friends and coworkers. 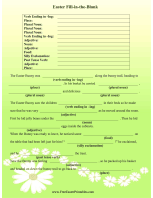 The printable letter talks compares the rabbit's holiday to Christmas. 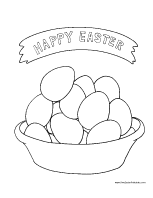 What, you weren't expecting a gift from a Secret Easter Bunny this year? Well sure, everyone knows about Secret Santa, but that doesn't make it very secret, does it? It takes a bunny to be as crafty as I am. Santa is obvious. How do you think everyone knows so much about his operation? About how he rides reindeer and comes down the chimney? He's been caught too many times. No one knows how the Easter Bunny works. So you'll have to think really carefully about whom this sneaky rabbit might actually be and how I know that you'll love this gift!